Play Temple of Iris Slot Online with 500 Free Spins! Temple of Iris (not to be confused Temple of Isis) is an Eyecon online slot game with a 95.4% RTP. This game has Free Spins bonus rounds with all wins tripled. Temple of Iris slot online game is an intriguing, captivating and an amazing game. Take out your mobile or desktop, launch and start making money with this fascinating game. The temple of Iris is based on a fable about a temple dedicated to the Egyptian goddess who was worshipped and venerated as the mother of Egypt. Uncover the secrets that are harboured by one of the Seven Wonders of the World. Raid the pharaoh’s tomb to recover some relics and treasures. The background of the game comprises of a desert with notable pyramids and an overhead charming sky. There are enjoyable music and great design to enhance your gaming experience. RoseSlot.com, a ladies slot UK brings you this exciting game. You can play it on your mobile or desktop. For those who will love to play slots online win real money game, Temple of Iris slot game is just the perfect game for you. Temple of Iris slot game has 5 reels and 25 pay-lines. The symbols that you will see on the reels are the eye of the Horus, the ruby scarab, the gold snake, the ankh, the Egyptian cat and high card symbols. The priestess of the temple of Iris is the wild symbol. The scatter symbol is the pyramid. 3 or more scatter symbols regardless of their position on a reel trigger the free games feature where players will be offered 15 free spins and 3 multipliers. The RTP is 94.5%. There is an Autoplay option, which enables you to sit back and spin the reels automatically as many succession as you want without interruption. There are multiple bonuses such as free spins, scatter symbols for bigger wins and the bonus rounds. Sign up at roseslots.com to start enjoying these bonuses. During Free Spins, your wins will be tripled. If the scatter symbol eventually completes a combination, your prize will be doubled. 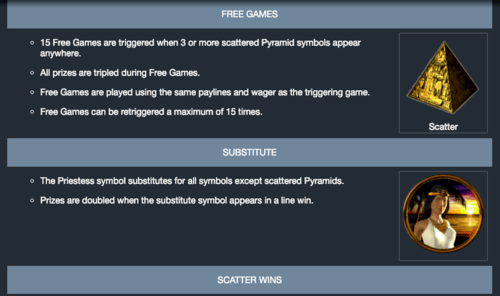 In addition, the scatter symbol offers 2 credits, 5 credits for 3 symbols, 20 credits for 4 symbols and 450 credits for 5 symbols. An interesting feature has been added to the game to make it more fun. This feature is the gamble bonus feature. You can place a wager for between 1 and 2 credits from 1, 2, 3, 5, 7, 10, 15, 20, 25, 30, 40 and 50 coins per line. Temple of Iris slot games is developed by Eyecon, an Australia based mobile slots gaming software developing company. Games like the temple of Iris slot game include Ramses Riches Slot, Crown of Egypt Slot, Legends of Cleopatra Slot game, The Lost Slot of Riches, Riches of Ra Slot, Pharaoh’s Luck Slot, and Pharaoh’s Dream Slot. This Egypt-themed online slot, with a 5x3 layout, 25 fixed paylines and RTP at 95.4%, is brought to you by Eyecon. With both the land and the symbols of Ancient Egypt used as the theme, this game would best be classified under the ‘adventure’ category. The top jackpot offered within the game is 1350x the line bet, with double-or-nothing Gamble and Free Spins available as bonuses for players. Ever since Howard Carter broke into the tomb of Tutankhamen in the 1920s, the world has been fascinated with the myths and legends of Ancient Egypt. That great, lost civilisation, seemingly so far ahead of its time, almost feels like an alien race to us. Ancient Egypt was a land of Pyramids, Pharaohs and empires, where people worshipped Gods that took on the faces of animals, and people bathed in milk. It really captures the imagination in a way that very few other historical eras do, and that makes it a constant source of inspiration for leading slot game developers. 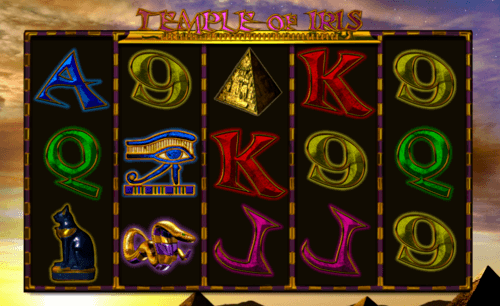 Temple of Iris is something of a historical artefact in itself; it was the very first slot game ever released by Eyecon all the way back in 2003 when it was known as ‘Temple of Isis'. The developer has since gone on to achieve legendary status with the Fluffy Favourites series of games, but much of their design skill and creative approach to making games is on display here, right from the start. Owing to the fact that it's a little older than many of the other games we offer at roseslots.com, this is admittedly not the most graphically stunning online slot you're ever going to play. It's far from ugly though, and still holds more visual appeal than many brand new games on the market. The approach is simple but solid. All you really need to do to set the scene for Egypt is show us the Pyramids, and that's what Eyecon have done in the background. Egyptian patterns frame the reels, the sun is setting on the game world behind them, and the lack of over-the-top animation allows players to focus on what really matters; spinning the reels. You’d expect an online slot game that was made a while ago to have something of a traditional feel, and that’s reflected on the reels. The lowest value symbols are playing cards 9, 10, J, K, A an A. Above them are an Ankh cross, cat-headed God Bastet, Apep the snake-headed god, the iconic Eye of Horus, and a scarab beetle which will probably make you itch if you’ve ever seen ‘The Mummy Returns’. The wild in Temple of Iris is High Priestess. As well as paying out cash prizes if you can land five of her symbols on the same spin, she’ll substitute for any symbol other than the scatter to create winning combinations. Any win she’s involved in doubles in size, which is very kind of her! The world-renowned Great Pyramid of Giza serves as the game’s scatter. As well as being a valuable symbol in its own right, landing three or more on the same spin will open up the game’s bonus feature for you, which we should talk about in more detail. There are two bonus features on offer to players in Temple of Iris. This is a simple and solid offering, and Eyecon hasn't included too much in the way of distractions that would take away from that fact. The first, and most lucrative, is a Free Spins feature. Back in 2003, having any bonus features was a major plus for an online slot, and Eyecon must have stood head and shoulders above their competition with this. Three scatter symbols gets you 15 free spins, with an additional five spins for any scatters located beyond that. All the winning lines you find during your free spins are worth treble what they’d pay out during the base game, which is generous. In addition, the round will re-trigger if more scatter symbols appear during your spins, up to a maximum of 240 re-triggers. You’d have to be exceptionally lucky to make it that far, but it’s possible! If you’re familiar with Eyecon’s online slots, you may already know that they almost always include a 50/50 ‘double or nothing’ Gamble Feature. Amazingly, they've been offering that feature ever since day one! This feature may appear when you've found a winning line. It offers you the chance to double it up or lose it completely. You're offered a 50/50 choice, and if you choose correctly, you win. Nobody forces you to gamble your winnings though, so make sure you feel both lucky and confident before you accept the offer! Eyecon is an established online slot developer. They're known by most regular online slot players and respected by every other online slot developer. Although it would be difficult to definitely say any one company was the most widely known of all those who make slot games, Eyecon would be close to the top of the list for a lot of people. Among the many things they're known for is their use of original and unusual bonus features in games; a trait that may stem from their past as video game designers. Eyecon has been in existence since 1997, but you wouldn't find them making slot games in the late 90s. They never set out to get involved in this industry; they arrived here by chance. Their first major success was a 3D combat horror game named gore. Although it was never intended to be a blockbuster game, it was downloaded millions of times, and demonstrated that the two previously unrelated worlds of the internet and gaming were coming closer together. Correctly figuring that the world of casinos wouldn't be far behind, they shifted their focus to developing slot games, and the rest is history. After experimenting with the format and discussing the matter with several established firms in the sector, this game (Temple of Iris) was actually Eyecon's first ever release. It went live in 2003. At that time it was known as Temple of Isis, but it's been re-branded for obvious reasons. Other than that, the game has been completely unchanged for the fifteen-plus years it's been available. Making games that have longevity is something Eyecon do better than most; they've found the magic formula for creating something that players keep coming back to time after time. One of their games demonstrates this better than all the others. In 2006, Eyecon released an online slot game called Fluffy Favourites. It became a sensation, and as the years have gone by, it’s only become more popular. The game appeals to the inner child in all of us, harking back to a time where we went to bed surrounded by stuffed toys. Over ten years later, it remains Eyecon’s most popular game. Such is the popularity of Fluffy Favourites that it now sits at the centre of a whole franchise of games which uses the same characters. The developer took a slow and steady approach to releasing games in their early years, but more recently appear to have upped production. They’re releasing more slot games now than they have at any point in the past, and they have over sixty currently available. When they do release a game, it’s bound to attract players; on average, Eyecon online slots are played at a rate of 11,500 spins a minute. That’s over six billion every year; a number so high it almost defies imagination. With that kind of success, it’s no wonder they’ve been able to branch out from Guernsey and open offices in Australia. "Temple of Iris slot game will take you back in time to Ancient Egypt. First of all, you can visit the incredible pyramids, and furthermore, you'll meet Iris. The graphics are authentic, with hieroglyphics covering the background, and the reels are filled with Ancient Egyptian artefacts and symbols, including the eye of Horus, a gold snake, Bastet, the ankh (an Ancient Egyptian symbol for life) and more. Get ready for the journey of a lifetime as you travel through time and, of course, win big in Temple of Iris Slots." Just because a game is old doesn't mean it's past its best. When a game is no longer capable of competing with newer alternatives, developers usually take it offline. Eyecon has kept Temple of Iris running because it's a timeless classic, which was built to last and still has plenty to offer. No major online slot developer's roster is complete without at least one game that's based in Ancient Egypt. Some of the older, larger and more established developers have used the theme more than once. Eyecon definitely belongs to that category, and so you'll find more than one Egyptian themed offering in their catalogue. Here are their other takes on the theme. Temple Of Iris Jackpot: Nine times out of ten, when a developer is creating a ‘jackpot' version of one of their existing games, they keep the entire base game exactly the same as the original, and link it to a progressive jackpot. That's all ‘jackpot' really means in the game's titles, and that's all players want and expect from these variants. Eyecon's jackpot version of Temple of Iris is almost identical, but not entirely. For some reason, the priestess symbol from the original game has been removed and swapped for a blue-faced God who looks a bit like the genie from Aladdin. It doesn't change the functionality of the game, and we don't know what the reason for the change is. RTP in this version of this game drops to 89.9%, which is expected of jackpot games. The progressive jackpot that the game connects to is, in theory at least, unlimited. Caravan to Cairo: If Eyecon took Temple of Iris and put it together with Fluffy Favourites, and the two games produced a baby, this is what it would look like. Caravan to Cairo makes excellent use of Egyptian scenery as a backdrop and does a fine line in Egyptian themed music, but the cast of adorable animals who turn up as symbols are the real stars of the show. Despite that this is actually a sophisticated game, offering 243 ways to win backed up by a free spins feature, and RTP of 95.20%. We don't know if there's much crossover between animal lovers and fans of Egyptian mythology, but if there is, then those people will adore this game! Pharaoh’s Luck: Just because you've done something twice doesn't mean you can't go back for a third time, and with Pharaoh's Luck, Eyecon has. Pharaoh's Luck online slot does away with the cute and cuddly feel of Caravan to Cairo and provides a more adult and serious atmosphere. This game is solid without being overly sophisticated. Golden treasures from Egypt's past appear on the reels, as well as hieroglyphs and other symbols of the ancient world, and a couple of Eyecon's signature bonus features such as a prize picker and a ‘gamble' mode which allows you to take ‘double or nothing' bets. In many ways, this is a more modern take on Temple of Iris, with 95% RTP. We've already talked about the popularity of Ancient Egypt as a theme for online slot developers, and most of them offer at least one game which uses it as a setting. At Rose Slots, we have this market well covered, and offer several more games which take their cues from the Egyptian world. Here are a few of the best-known ones. Legend of Cleopatra: This highly original and quirky game is a product of Playson. It definitely isn't one for those who prefer traditional or conventional games, but if you have a taste for the unusual, it might just be the game you've been looking for. It's a six reel game, with only two rows on the first reel, increasing by one row as you go along. The complex and unorthodox structure pf Legends of Cleopatra provides 100 fixed paylines, backed up by a couple of powerful bonuses and 95.05% as an RTP rate. It might take some getting used to, but we think you'll be glad you did. Ancient Egypt: Pragmatic Play have a vast array of online slot games in their catalogue which use history as a source of inspiration, and so it's no surprise to see that they have a strong Egyptian offering of their own. The developer is known for their sleek, smooth graphical style, which is very much on show here. It's a truly pretty game, and owes a little of its appearance to the Elizabeth Taylor movie ‘Antony and Cleopatra'. There may only be ten fixed paylines in the game, which also has a standard 5x3 layout, but the RTP of Ancient Egypt is a healthy 96.13%, and there are several bonus features to aim for too. Scrolls of Ra: ISoftbet aren’t as well known as the other developers we’ve looked at so far, but it’s a very solid game, and in terms of the way it’s presented and the way it plays, it’s probably the closest thing out there to Temple of Iris. The aesthetics are clean and uncomplicated, and the functionality is simple. RTP comes in at 95.71%, backed up by a couple of bonus features that are especially sleek considering the game’s basic design; especially the prize-picker round. Naturally, you may have some concerns about playing Temple of Iris on a smartphone or a hand-held device. The game was released in 2003; a time when mobile gaming had barely even been dreamed of. Eyecon is known for taking care when converting games to run on mobiles, but have they been this far back through their catalogue to make sure Temple of Iris is up to scratch? Yes, they have! They've shown it every bit as much love and attention as they do with their more recent releases, and the net result is that Temple of Iris is a delight to play on a phone. It's come through the conversion process almost unscathed. The functionality is unaffected, nothing's been cut out, and the sounds are just as clear. Cleverly, the game can tell which way up you're holding your phone; tilt it to the side, and the buttons relocate to a more convenient position. Tilt it back, and back they go to where they started, without pausing or breaking the game. Not every developer can make this work, and so Eyecon should be congratulated for tailoring their oldest game in this way. We did say ‘almost’ unscathed though, and there is one minor negative. For some reason, the graphics seem a little bit fuzzy when playing on a phone. It’s not so bad that you can’t make them out or tell what’s going on, and it certainly doesn’t stop you enjoying the game, but it is noticeable. Perhaps that’s something to do with the fact that the original game was never designed to be played on mobiles. We’re happy to play the game on a phone, and it doesn’t spoil the fun, so you just have to forgive it for not quite looking its best. There isn’t really much to mention in the way of news regarding Temple of Iris. Both the mainstream and industry press usually reserve their attention for new releases, and so a game that was released well over a decade ago doesn’t stand much chance of attracting anybody’s attention now. There’s simply no reason to report on it! The game doesn’t need to be reported on though; the fact it still exists is newsworthy. This is an online slot that was released before Facebook was invented, and during all that time it’s seen off hundreds of competing games and managed to hold its own. It’s still a quality game today, and we think it will still be a quality game in another ten years, too. In fact, we predict that the next time the media starts to report on Temple of Iris, it will be because the game is celebrating its 20th birthday in 2023! We take our responsibilities seriously here at Rose Slots; we want to cater to all tastes. While on the one hand, that means keeping our eyes peeled for the latest releases and newest ideas, it also means always providing a home for the classics. Temple of Iris is definitely a classic. If you'd like to play the game and find out exactly why it's been able to stay alive for so long, we'd love you to play it here with us at roseslots.com. There are many other online slot websites available, but we believe there are very few who can offer players the same range of games and incentives as we offer at Rose Slots. There are more than six hundred slot games in our library, featuring some of the best-known slot games in the world, and also some hidden gems. No matter what your preferred genre is, or if you play with a big budget or a small one, we have something here that will suit you perfectly. Not only that, but you can browse them at your leisure without handing over your money. Unlike many of our competitors, we don't demand a payment from you when you register. You only need to put money in your account when you want to play a game. We'll even give you some free spins every time you put £20 or more into your account. And that's on top of the free spins you could receive when you first register with us. If your luck is in, that might be as many as 500! With cashback incentives available every week, fresh games added regularly, and a positive attitude to making our players happy in every way we can, Rose Slots is a website you can trust to give you the best playing experience both now and in the future.